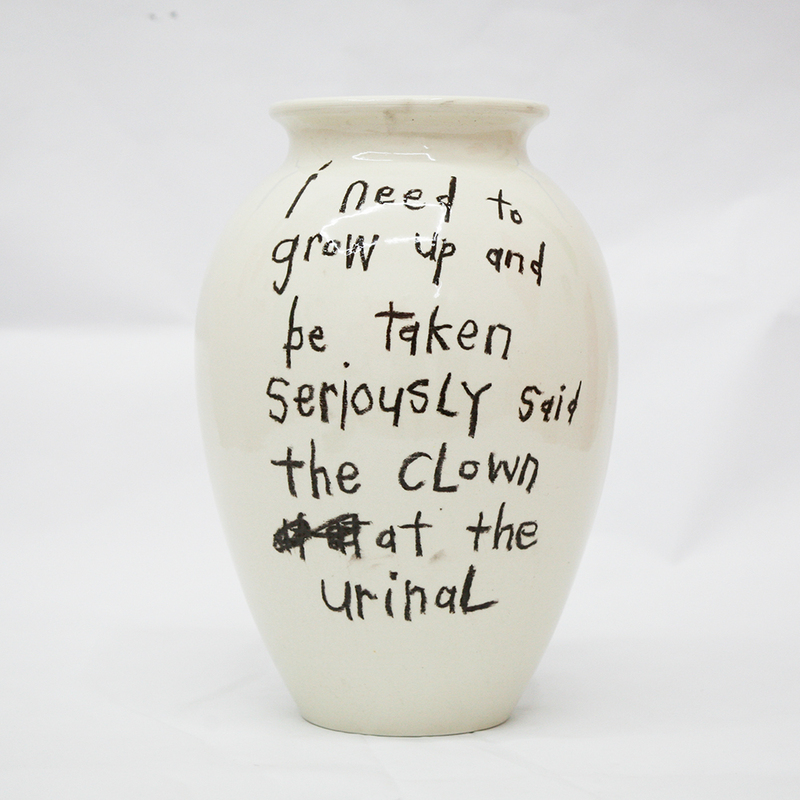 INVISIBLE-EXPORTS is proud to present I Need To Grow Up And Be Taken Seriously Said The Clown At the Urinal, an exhibition of new paintings, new ceramics, and new photo-collages by Cary Leibowitz. In 2016, at a Los Angeles auction, Cary Leibowitz bought, as a present for his husband, a desk that once belonged to Joan Collins. When the desk was delivered they were delighted to discover, tucked into its drawers, an entire cache of stuff that belonged to Collins—including her wallet and Neiman Marcus credit card. Collins has always been an icon to Leibowitz, but this show — I Need to Grow Up And Be Taken Seriously Said the Clown At the Urinal — is the first oriented towards her presence, with a number of Leibowitz’s iconic text paintings addressing her, especially the idea that what we love about Joan Collins is that she wants to be Joan Collins as much as we want to be Joan Collins. The exhibition will also feature new Americana photo-collages, new text paintings (such as George Washington Redecorates Mount Vernon, Elizabeth Taylor is Thinking About Fried Chicken, Ugh He’s Crying Again, and Respect for the United States Constitution is a Turn On), as well as new ceramic works—the hand-glazed objects Leibowitz has produced periodically throughout his career as a distinctive form, the unique bespoke multiple. Cary Leibowitz (b. 1963) has exhibited in museums and institutions across the globe including the Institute of Contemporary Art, Philadelphia; The Contemporary Art Museum, Houston; The Contemporary Jewish Museum, San Francisco; The Jewish Museum, New York; the Indianapolis Museum of Art, Indianapolis; PS1 MoMA, New York; to name just a few. His work has been reviewed in the New Yorker, Artforum, The New York Times, Frieze Magazine, Art in America, among others, and is included in the permanent collection of the Chase Manhattan Bank, the Hirshhorn Museum, and The Jewish Museum in New York.